I received product for review from Young American Princess. The opinions within this post are of my own and I was not influenced in any way. Please do your own research before purchasing products or using services. Your opinions and results may differ. If you ask little girls what they want to be when they grow up, most likely they will answer with wanting to be a princess. There's something magical about princesses, and young girls love all the amazement that comes with it. If you know a child who is into princesses, you will want to check out the You Are A Princess doll line. 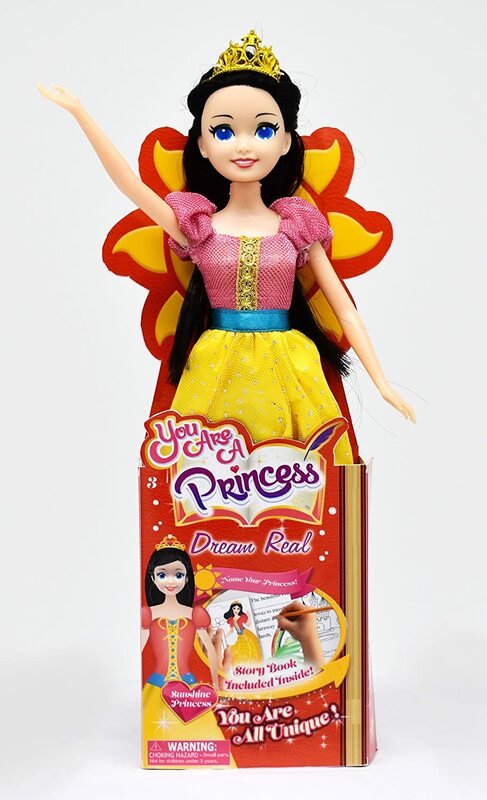 The You Are A Princess dolls allow young girls to dive into their imaginations and create a unique character, identity and backstory for their doll. This type of play differs from other types of doll play where the dolls background and personality have already been developed. Each doll features a ‘create and design’ your own story and coloring book. Each Princess set comes with a doll, a create-and- design your own story and coloring book, and a patented stand for the doll. The dolls come in two sizes, small and large. Their features and characteristics resemble those of other famous princesses. 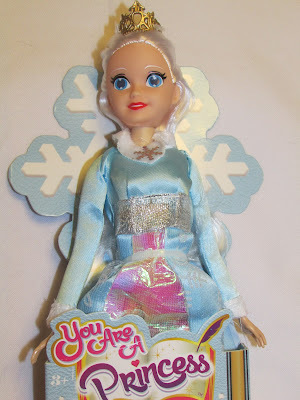 I received a small doll - Snowflake Princess- that stands at 11.5 inches. 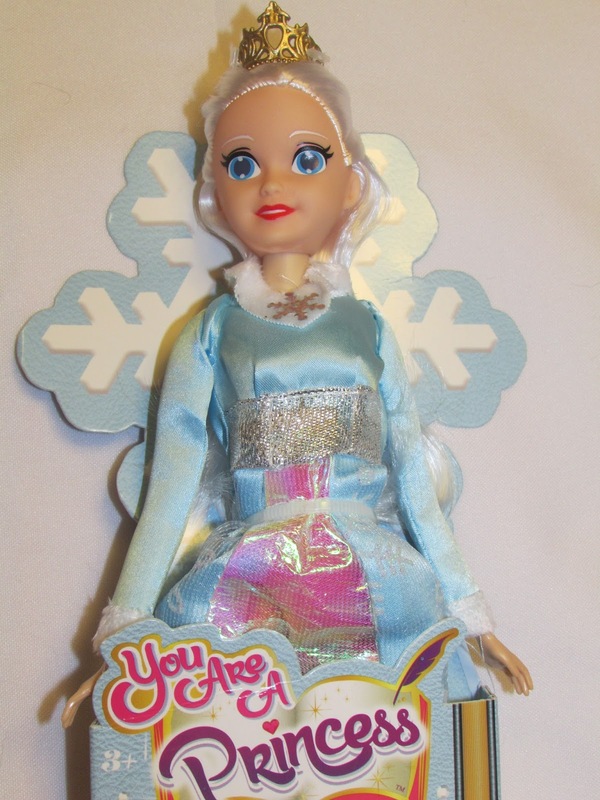 This particular doll has snow white hair and a blue dress. She wears a gold crown atop her head. The arms and legs of the doll move up and down. The dress can be taken off and put on again. The included story and coloring book is attached to the box that the doll is packaged in, so it's important not to tear up the box to get to the doll. The book has fill-in-the blank sections for a child to write in their desired information, and the last page allows the child to finish the story with their own ending. Some of the pages can also be colored. It gives your child the opportunity to develop their own story line for their princess doll. 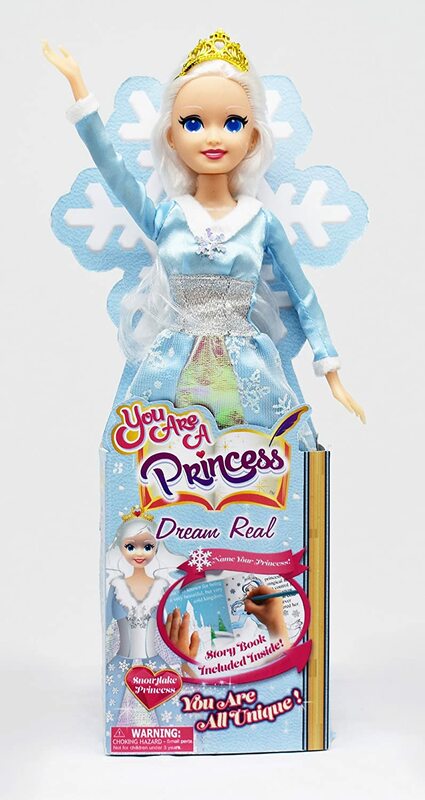 One person will win a 11.5" You Are A Princess doll. I love Cinderella and her fairy tale story. It was always my favorite. Sleeping Beauty was and will always be my favorite Princess. Belle from Beauty and the Beast is my favorite. Snow White has always beeen my favorite. My little cousin likes Jasmine. Cinderella was and still is my favorite. Cinderella will always be my favorite! Sofia the First because my little granddaughter loves her. I actually love Princess Merida from Brave! She tells it like it is, and she doesn't need a man to save her. She can take care of herself! My granddaughter is learning these awesome lessons. When I was little, it was always about being saved by a strong Prince! Ugh...anyway, that is my favorite! God bless and good luck to everyone! Ariel has been my favorite for the longest time. But Moana is a new favorite of mine! sleeping beauty is my all time fav! Fav princess would have to be Princess Buttercup in The Princess Bride. My favorite princess is Belle! I've always loved Ariel, but belle is my daughter's favorite. Princess Diana for a real one, as for the storybook one: Ariel. My all time favorite princess has always been Belle. I've always loved Sleeping Beauty....Princess Aurora. Belle has always been my favorite princess from Disney. Princess Kate is my favorite real princess. I also like Belle. Cinderella has been my favorite princess since I've been a kid. Cinderella is my most favorite,with such a great ending! Ariel is my favorite Disney princess! Cinderella has always been my favorite Princess. Ariel is my favorite princess.She's so cute and it brings to mind my little niece singing the movies songs! My favorite princess has always been Cinderella ever since seeing the original Disney movie at the movie theater way back in the early 60s. Over the years I've watched just about every remake out there. Moana is a current favorite in this house, even though she claims she in NOT a princess! My favorite princess is Ariel. I have a ton of pillows on my bed and that makes ME feel like a Princess, does that count? I love Princess Ariel as well as Anna and Elsa! Cinderella is always our favorite Princess. My favorites are Cinderella and Snow White!! My favorite is Cinderella. Who wouldn't just love to be in her shoes. I wanted to say, I think I said on another giveaway that I entered a Kidadorable giveaway as another giveaway on your blog and I was wrong lol I have a bunch of tabs open and that one is not one from your blog, I'm sorry. Hope you'll forgive me! My favorite is Princess Leia Organa. I love Cinderalle as a princess because it could happen. I always liked Rose Red. My favorite Princess is Cinderella! I've always dug Boudicca of the Iceni, who led a revolt against the occupying Roman army in Britain. My all time favorite is Cinderella! Thanks for the giveaway! My favorite princess is Merida.